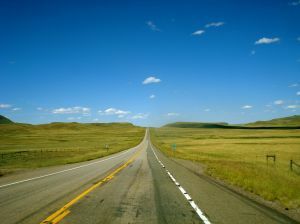 SLA’s strategic vision – what will you contribute to making it a reality? SLA is a vibrant, global association of professionals who are employed in every sector of the information and knowledge economy. Our members thrive where data, information, and knowledge intersect and our strategic partners support SLA because they believe in the association’s mission and the future of its members. The goal of SLA is to support information professionals as they contribute, in their varied and evolving roles, to the opportunities and achievements of organizations, communities, and society. In making the vision a reality the Board is concentrating on five key areas. Each area is being led by Board members and there should be reports on all the activities at conference in Chicago later this month. Annual conference – what should this look like in the future? Should there be more virtual activities? Professional development – how do we integrate and develop professional development offerings using technology; what will the revised competencies offer us? Creating a richer volunteer experience – what can we learn from the loyalty project and from our members’ experiences of volunteering following the recent survey? New markets through collaboration – what new markets can we find through learning and networking initiatives and through non-traditional collaboration efforts? Growth through diversification- how do we appeal to new members in allied fields? I’d advise all members to review the helpful presentation from Anne Caputo (SLA past President) which was part of Leadership and Management division’s recent webinar on SLA’s strategic vision. Also ensure you attend relevant meetings at conference (such as Leadership Orientation and Cabinet Meetings on Tuesday 17 July from 4pm) to find out more about making the vision a reality and asking questions about how it’s implemented. SLA is our association and we all need to contribute to making the vision a reality. I took part in last month’s survey on volunteering experience circulated by Liz Blankson-Hemans and Mary Ellen Bates, who are leading the work on ‘Creating a richer volunteer experience’. I was very impressed with the survey questions, they really made me analyse what I’d got out of my volunteer experience from both SLA and other associations. So I’ll be interested to see how my responses chimed with others and how these can be used to create a richer experience in SLA. I’ve also been thinking about what the future of annual conference could look like: would it work if it was every other year? I think it might just work, but only if supplemented by more use of technology to allow people to communicate more regularly. I see that ALA is changing the way it does its conference, is there anything we can learn from them or from others who are changing their conference model? And from the professional development perspective could there be some opportunities for partnering with an organisation, like the Open University, to offer discounted access to some of their CPD programmes? I was prompted to think about getting organised for SLA’s annual conference in Chicago by a combination of things this week: an email from SLA HQ announcing the leadership training session moving from its usual Sunday slot to a new slot on Tuesday; tweets from @Batty_Towers about dreams of missing suitcases and a realisation that it’s just eight weeks until conference starts. So I need to start organising myself and creating a checklist of what to do between now and then. This will be my ninth SLA conference so I should be good at this preparation bit, but still find it helpful to review what others have offered as tips and hints to getting the best out of conference. Here’s a summary of what I found. Over the years many people have shared tips and hints: Stephen Abram in 2006, Philadelphia chapter (last year’s conference hosts), and this year’s conference website. It’s also worth reviewing first impressions of others, here’s a selection of reviews of recent conferences from first-timers: Darron Chapman from TFPL on his first conference in Seattle in 2008; Ned Potter; Natalia Madjarevic; Sam Wiggins; Chris Cooper on their experiences as SLA Europe’s Early Conference Career Award winners in 2011. Conference planner use this to set up your schedule either online, or in Outlook. Choose all sessions that interest you and don’t feel you have to attend only those that your chosen division(s) run. I’ve always learnt most when I’ve gone to a session that has nothing to do with my daily work. Sessions – for each session have a plan B in case there are no seats left when you get there, or you decide it isn’t what you thought it would be so you walk out early. Plan B can include visiting the exhibition hall, taking a break, getting something to eat or going to another session. Session etiquette – means it’s ok to walk in late and to leave early (Europeans take note). First-timers and Fellows session is an essential if you’re a first-timer as it gives you a chance to meet other first-timers and gain some tips and hints on how to make conference work for you from the Fellows. Ribbons – you’ll find there’s space for ribbons on your name badge, do take advantage of any that apply to you, and get them from the Information booth. If you’re a first-timer make sure to pick a ribbon up, it’ll be a great ice breaker. 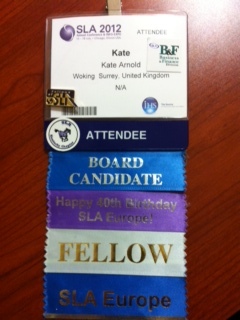 If you’re from SLA Europe don’t forget to pick up our special 40th anniversary ribbon. If you’re interested in how the association works (and we should all be, as it’s our association) then attend the Board of Directors open session on Sunday 15 July at 9am and see the elected board in action. There’s a leadership orientation session from 4pm on Tuesday 17 July at which SLA’s unit leaders and those who might consider a leadership opportunity meet to consider key questions for the association: “If we did not exist, what association model would we build now?”; “Finding and Grooming Tomorrow’s Leaders – Tailor to Your Unit’s Needs”; “How to parlay SLA experience into a promotion, a new job … even your LinkedIn Profile”. Days are long and busy, from breakfast meetings at 7:30am to parties that go on until after midnight. You need to remember to pace yourself, take a few breaks, even if it’s just a walk around the block. Above all else enjoy yourself, immersing yourself in a wonderful bubble atmosphere where you’ll meet some great people, learn a lot and hone your networking skills. Remember everyone attending has been a first timer at some point and is keen to network with you. You’ll make connections and friendships that will last a lifetime and who knows you might get sucked into doing lots of things for SLA. I never imagined at my first conference in 2000 that I’d be standing as candidate for SLA’s President-Elect in 2012.